Slim down and stay thin the socialite way! One of New York's top weight-control doctors finally reveals the secrets to the enviably lean bodies leaving her Park Avenue offices. Based on science, and proved by the success of client after client, Dr. Jana Klauer's diet is the key to how successful, rich, and busy modern men and women get it off and keep it off. Then add simple mind-set changes such as Dr. Klauer's Stop! Watch! method of craving control. Train yourself to eat the best-quality, most nutrient-rich foods -- such as smoked salmon, Greek yogurt, and moega-3 eggs -- at every meal. And learn how to eat at fabulous restaurants -- for business or pleasure -- and keep losing weight. 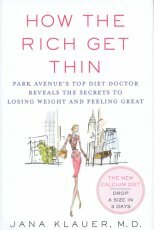 How the Rich Get Thin features wonderful recipes, including the low-cal dessert Le SociaLite, and a glimpse of the Park Avenue Mind-Set that allows Dr. Klauer's clients to stay lean and healthy for life.